By noticing how our bodies are expressing themselves we can often gain great insight as to what, where & how we are storing the inner conflict that can arise from stress, repression, trauma & maladapted beliefs. When we turn & face inward and look at what is right here and begin to notice the subtle and not-so-subtle ways our bodies are communicating with us, we may see that decades of experiences have been stored within us. Often our attention alone is enough to begin to free up this bound energy & release it through our nervous systems. During this 4 week process I encourage you to begin the practice of regularly checking in and simply noticing what you are experiencing within your body. By somatic I mean, of or relating to the body and experienced or regulated from within. 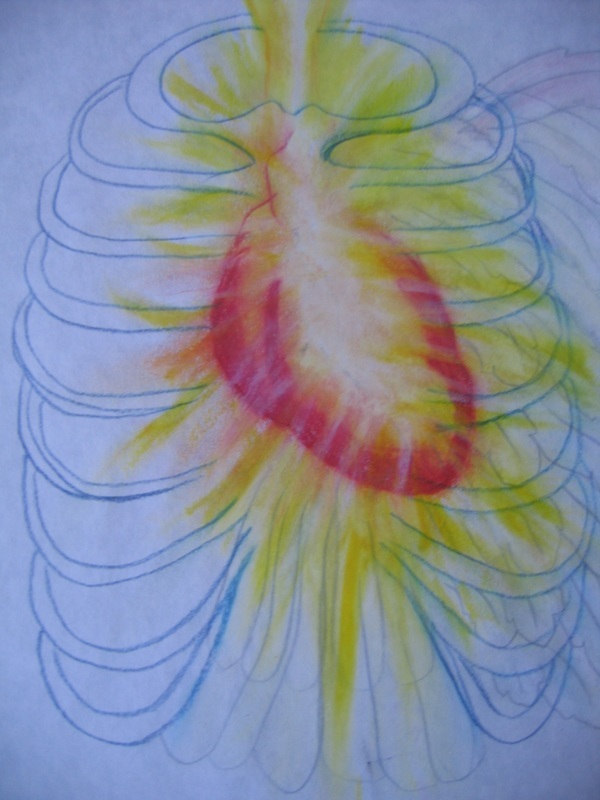 So somatic awareness is noticing the inner sensations you feel within your body. This is a fundamental tool used in all somatically based therapeutic practices, which has helped many people re-pattern their automatic responses to experiences that trigger unconscious conditioning. I will invite you to do this when you share your experiences in both the visual and written content of your journal, because this is how we affect change from the bottom up. Many of us have a great deal of experience with top down analysis and have great insight on our personal history. Yet often times this insight alone doesn’t change our reactivity. Beginning to work from the bottom up allows us to work with the energy that has been held in our bodies and unconsciously continues to fuel our reactions, despite our sincere desire to change. Begin by closing your eyes and taking a few slow breaths. With each breath allow your mind to settle into your body more and more. Then, with the perspective of a neutral witness, scan your body and notice whatever sensations are present without labeling them good or bad. Simply notice them and if you can, stay present to them with the same Compassionate Curiosity we used in the other exercise. More often than not you will find that simply observing and staying with a sensation allows it to shift and change. Sometimes you can even feel some sign of release, like a deep breath, tingling, twitching, pulsing, energy streaming or even stomach gurgling. burping and farting can all be signs of beneficially releasing held tension. This guided audio meditation can be used to help you practice focusing on your body sensations. Stereo headphones can be used to benefit from the wave sounds that pan from right to left. This is a from of bilateral stimulation that can help us relax and balance the hemispheres of the brain.